Below is our definitive list of the diamond cuts that were popular throughout the early 1900’s. Most of these vintage diamond cuts are still very popular. Some of the diamond cuts have since waned in popularity. This revered diamond cut goes by several different names. Most of the names will vary depending on the era of the diamond. This antique diamond is also known as the Old Mine Cushion Cut, Antique Cushion Cut, High-dome Cushion Cut or Vintage Cushion Cut. 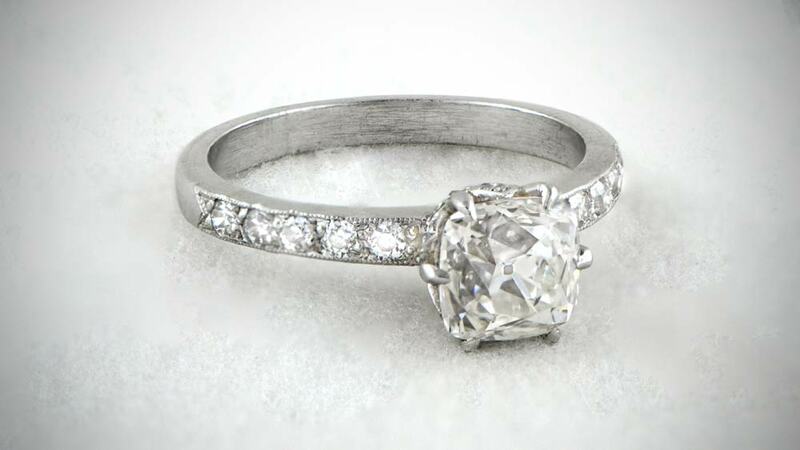 The Antique Cushion Cut is one of the most recognizable diamonds in the vintage engagement ring world. Most of the famous jewelry of the previous century features a cushion cut diamonds. To learn more about the antique cushion cut diamond, click here. 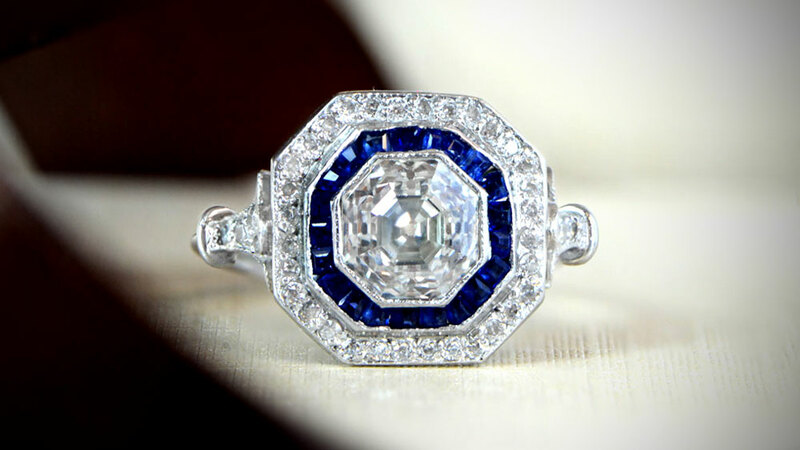 Want to see our collection of antique cushion cut diamonds? Click here to view the rings. 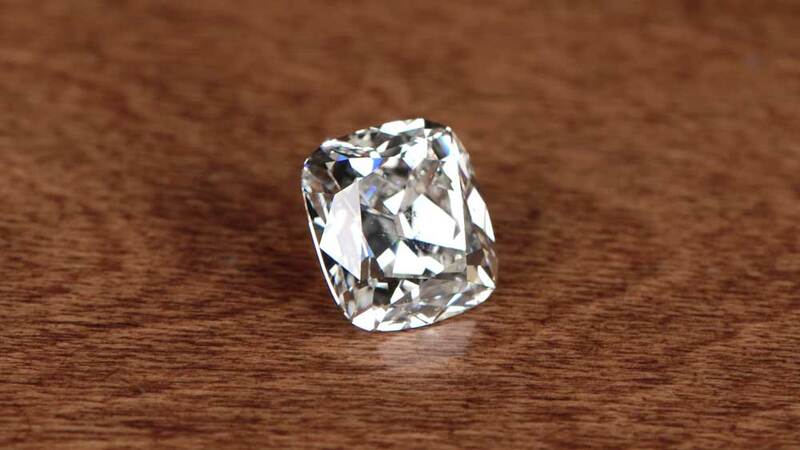 The old European cut diamond may not be as famous as the cushion cut diamond, but it without a doubt the most popular antique diamond in the market. The old European cut diamond goes by many names. Among the names are the old-mine round cut, old-euro cut, antique round cut, antique old European cut, and old-mine brilliant. The Old European Cut diamond is the progression between the antique old-mine cut diamond and the transitional cut diamond. The Old European cut diamond ultimately led to today’s modern brilliant cut diamond. The Old European will always contain a noticeable culet. The size of the culet may vary but a genuine old Euro will always have a culet that is detectable with a loupe. 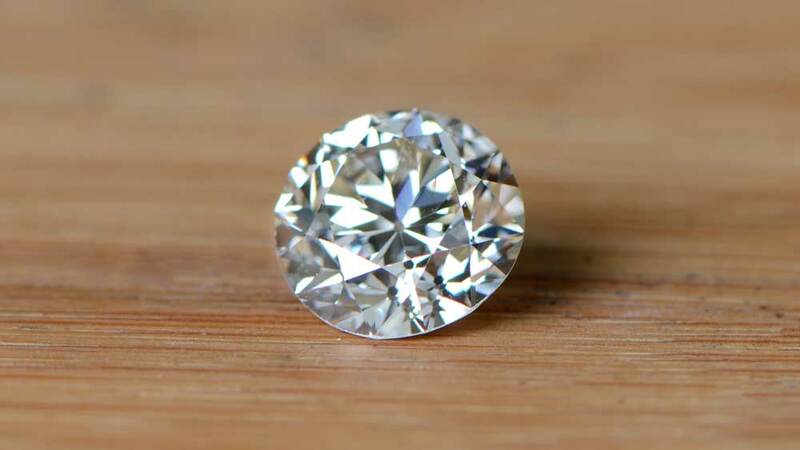 Old European Cut Diamonds will not usually be perfectly round. Antique diamonds were cut by hand and so the perimeter will not be as accurately shaped as a modern diamond. 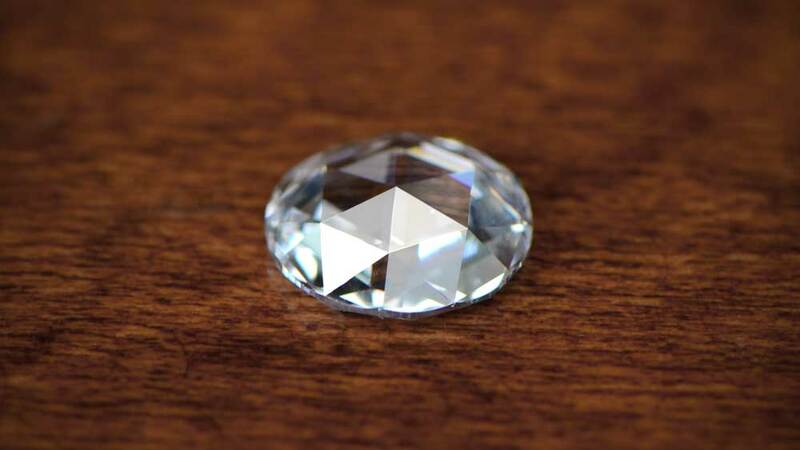 Click here to learn more about the Old European Cut Diamond. Visit our collection of old European cut diamond rings by click here. This is a difficult diamond to define because technically speaking all antique diamonds in the cushion-cut and round-cut families also fall under the umbrella of the old mine cut diamond. For clarity, most jewelers will call antique diamonds with uneven shapes as old-miners. Anything with a more distinct shape (example: old Euro or antique cushion), although technically also an old-mine cut, will follow its more specific name. Genuine old mine cut diamonds are very rare. Most of the old-miners from the late 1800’s or early 1900’s were lost with time or destroyed by modern jewelers. To learn the complete difference between old mine cut diamonds and the modern brilliant cut diamond, click here. Visit our collection of old mine cut diamond rings. The rose cut diamond was a very popular diamond during the 1800s. Once the Old European cut diamond began to become popular, the rose cut diamond faded into the background. Only very recently (2015 or so), the rose cut had a massive comeback and is now trending strongly among vintage enthusiasts. The rose cut doesn’t have a pavilion and even it’s crown doesn’t have a table but is rather made-up of triangular facets that create its distinctive shape. Beneath the crown of the rose cut is a girdle. Antique rose cuts won’t have a smooth and polished girdle but will rather show a frosty (or matte-like) girdle. The back of the rose cut is smooth and transparent. To learn everything that you need to know about the rose cut diamond, click here. The Asscher Cut diamond was the original patent of the famous diamond-cutting Asscher Family. This cut has remains still fascinating so many decades later. Like the antique cushion cut, many of the most important rings in the past 100 years have showcased Asscher cut diamonds. The corners of antique Asscher cut diamonds will usually be a lot more prominent than modern Asscher cuts. Many antique Asscher cuts will appear almost octagonal. To learn more about Asscher Cut Diamonds, click here. Click this link to view our collection of Asscher cut rings. The Emerald Cut diamond is one of the most famous step-cut diamonds. This cut, famous for its flashes of brilliance, still mesmerizes with very little change to the dimensions. Finding antique emerald-cut diamonds is very challenging. 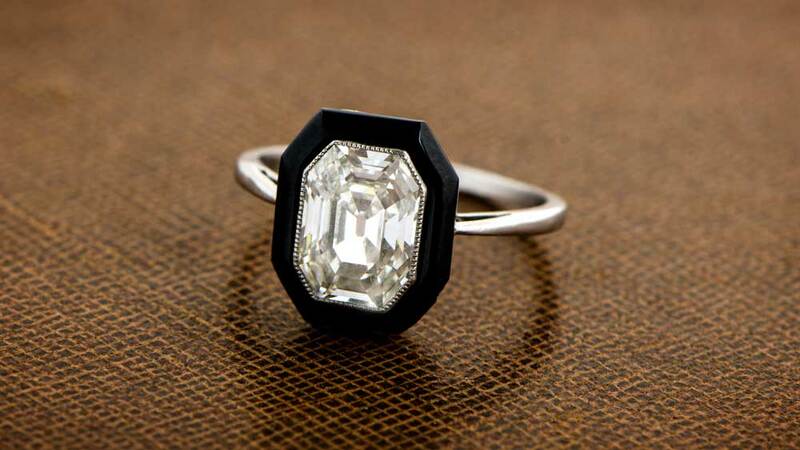 Most collectors will only have a few genuine antique emerald-cut diamond rings. The characteristics of the antique emerald cut diamond are very similar to the notable features of the antique Asscher cut diamond. The primary difference between the two cuts will be the dimensions of the actual stone. The antique emerald cut diamond is a rectangle in shape while the Asscher cut is more square. There are so many websites selling vintage style engagement rings and yet they fail to incorporate an antique diamond. Learning the different antique cut shapes and discovering which shape suits your personality should be one of the first steps of buying an antique ring. See the info-graph below to see examples of the different diamond cuts.